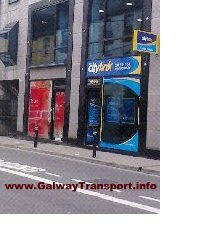 The route Galway City 9 bus service also goes to the racecourse, but there are some restrictions during peak racing traffic hours Mon - Fri. Details below. The route 3 - Ballybrit bus does not get you to the racecourse due to the dual carriageway layout. Bus Éireann are running special races shuttle buses from Eyre Square on each day of the Galway Races summer festival meeting (25 - 31 July 2011). These are shuttle buses, and do no pick-up or drop-off along the way. Farrell Travel are operating a shuttle bus from the Claregalway Hotel - contact the hotel for more information. Bus Éireann Route 9 city buses leave from Eyre Square, travel along College and Dublin and Doughiska Rds, and go to the Avenue (back) entrance to the racecourse - number (5) on the Parkmore area map. The last bus-stop serviced during these times is at the top of Doughiska Rd - number (1) on the Briarhill area map. People travelling to the racecourse on route 9, or working in Parkmore area (Parkmore West Industrial Estate, Parkmore East Business and Technology Park, Galway Technology Park, Racecourse Business Park Briarhill Business Park), will need to walk for approx 15-20 minutes from this stop. There is an underpass beside the Clayton Hotel, which is safer than crossing the dual-carriageway. Burkes Buses have cancelled several regular early-morning and evening services. See their website for details. Farrell Travel have cancelled their 5:15pm Galway to Athenry service during Race Week. All other services will operate to timetable. Irish Rail's August Bank Holiday weekend timetable has some Galway service cancellations for Sunday 31 July.